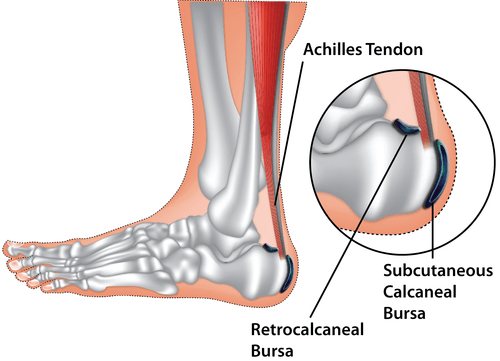 Retrocalcaneal bursitis (also known as achilles bursitis) occurs when there is an injury at the posterior calcaneus (the insertion site of the Achilles tendon at the heel) or at its associated bursae (a fluid-filled sac to help the motion of associated structures). It can be a debilitating condition that is characterized by pain anterior to the Achilles tendon and is sometimes confused with Achilles tendonitis. Retrocalcaneal bursitis is also known as Haglund syndrome, Albert disease, calcaneus altus, pump bump, winter heel and achillodynia. It is a fairly common disease among the general population. The inflammation of the bursae is usually due to repetitive injury or better known as the overuse injury. Retrocalcaneal bursitis is aggravated by pressure, for example when patients are wearing tight shoes. It is also associated with other disorders such as gout, rheumatoid arthritis, and other arthritic diseases. Haglund deformity (bony enlargement on the back of the heel) which also causes an impingement and may contribute to the development of this disorder. Understanding these risk factors can provide an advantage in preventing achilles bursitis or limiting the damage already caused. Pain that is aggravated by movement of the foot. Pain may also radiate to the surrounding joints and may limit the person’s activities of daily living. Someone with this injury may also report limping. The area may be warm and tender to touch. The person should be asked regarding their footwear: if they wear high-heeled shoes, tight fitting shoes or if there is any recent change on footwear. Those who are used to wearing high-heeled shoes may also experience symptoms of retrocalcaneal bursitis if switching to flat shoes. It should be kept in mind that retrocalcaneal bursitis can be unilateral or bilateral. Symptoms are often found to worsen when the athlete is first beginning an activity after a period of rest. If the person has bilateral retrocalcaneal bursitis, an underlying inflammatory arthritis should be considered. The diagnosis of retrocalcaneal bursitis can be made with the help of person’s medical history and examination of theeir heel. The healthcare provider should look for the possible causes of retrocalcaneal bursitis by eliminating possible factors such as a change in shoes, increased activity or the wearing of high heels. Other symptoms and signs of any arthritis should be assessed and laboratory tests should be done to rule them out. Imaging studies such as x-rays of the heel may reveal deformities (Haglund deformity – bony enlargement). X-rays may also be used to support the diagnosis of retrocalcaneal bursitis or to rule out other possible diagnoses such as stress fractures. Other imaging such as magnetic resonance imaging (MRI) scan and computed tomography (CT)may also show evidence of inflammation of the bursa. There is no current definitive diagnostic measure that exists but ultrasound is gaining acceptance due to its ability to aid the diagnosis and its relatively inexpensive cost. Treatment for retrocalcaneal bursitis can be conservative and includes the application of ice to the heel and ankle when there is an acute episode of pain and inflammation. It can be performed several times a day with each episode lasting about 15-20 minutes. Rehabilitation is also recommended by progressively stretching the Achilles tendon as it may relieve the impingement of the bursae. Rehabilitation is advised to be continued with a gradual increase of activities and aims to return the patient to their previous level of function. The activity should also be limited or modified. It can be done by choosing a recommending a different activity such as swimming and other aquatic exercises as it helps to maintain strength and cardiovascular fitness. Other measures that may help includes the use of an open-backed shoe as it will relieve the pressure on the heel. If it has been found that the retrocalcaneal bursitis was caused by the change from constantly wearing high-heeled shoes and transitioning to flat shoes, the use of a footwear which has a medium heel may be necessary. The heel height may be gradually decreased to help the transition to flat shoes. Athletes should also be advised to regularly change their running shoes as the support and fit may gradually wear out with use. Soft inserts can also be used to decrease friction or pressure. It is recommended that shoes with laces be used as it enables individuals to adjust the shoes to their own fit. If inserts are used, it is important that it is also important for it to be inserted on the other side to reduce leg-length discrepancy. Over the counter analgesics (Non-steroidal anti-inflammatory drugs) may also be used to aid in pain relief. Corticosteroid injections may be recommended for the retrocalcaneal bursa if the patient has been warned and advised regarding the risks of Achilles tendon rupture particularly if image guidance is not available. Partial immobilization or the use of an immobilization cast should be used for 4-6 weeks if symptoms are resistant to conservative treatment. Surgery should be considered for those who do not respond to conservative measures or for those who have significant progression of their symptoms. It was found that endoscopic surgery may have better outcomes compared to open surgery. Patients can be gradually allowed back to their activities after their symptoms of pain and limping resolve. They should be monitored if they can performance without the recurrence of symptoms. They should be advised that by returning to activities without resolution of symptoms, symptoms may worsen and it may progress to chronic retrocalcaneal bursitis leading to an increased amount of healing time. Most people respond well to conservative management and education is important as it prevents future episodes of recurrences. Kondreddi V, Gopal RK, Yalamnchili RK. Outcome of endoscopic decompression of retrocalcaneal bursitis. Indian Journal of Orthopaedics. 2012; 46(6):659-663. Aaron DL, Patel A, Kayiaros S, et al: Four common types of bursitis: diagnosis and management. J Am Acad Orthop Surg. 2011; 19:359-367. Foye PM. Retrocalcaneal bursitis. Medscape. 2014. http://emedicine.medscape.com/article/86297-clinical. Accessed 1/22/2017. Blankstein A, Cohen I, Diamant L et al. Achilles tendon pain and related pathologies: diagnosis by ultrasonography. Isr Med Assoc J. 2001; 3(8):575-578. Reiter M, Ulreich N, Dirisamer A, Tscholakoff D, Bucek RA. Extended field-of-view sonography in Achilles tendon disease: a comparison with MR imaging. Rofo. 2004; 176(5):704-708. Keener TS, Winter TC. Retrocalcaneal bursitis in a patient with psoriatic arthritis. Journal of Diagnostic Medical Sonography. 1996; 12(5):217-219.